Winter is a time for mulling. Mulling over ideas, goals, and plans for the future. Mulling wine and cider, or spices for hot toddy’s. Mulling in the warm, comfortable, slow pace of home. Sleeping, dreaming up visions for what is to come, sitting quietly. That is what is happening now. Thanks for the help of my cousin Beth Galbraith, and close friends Amber Faist & Alex Scott, these turned out great! We were so blessed to have two amazing Rabbi’s there to officiate us. Rabbi Steven Abraham was our local moral support and advisor through the whole process, which was incredibly valuable to us. Rabbi David Glickman introduced us and did a fantastic job leading the ceremonial events of our big day. Here are the Rabbi’s and GranDanny signing the Marriage License which my father also signed. Traditionally, the Ketubah is a document signing the wife over to the new family, done only between men. But in our modern day society, I got to sign it! Next we had the Bedeken (women only) & Tish (men only). Where women receive advise and compliments, and men typically give a teaching. Next, the men’s Tish brings the groom to the Bedeken to greet the bride and veil her prior to the ceremony (pictured right). Then the procession began, we did the traditional seven circles (pictured left). Our fathers paraded Ben to greet me, surrounded by friends and family. Photo Credit Ariel Panowitz. I was veiled. Then folks were seated and we proceeded down the aisle. 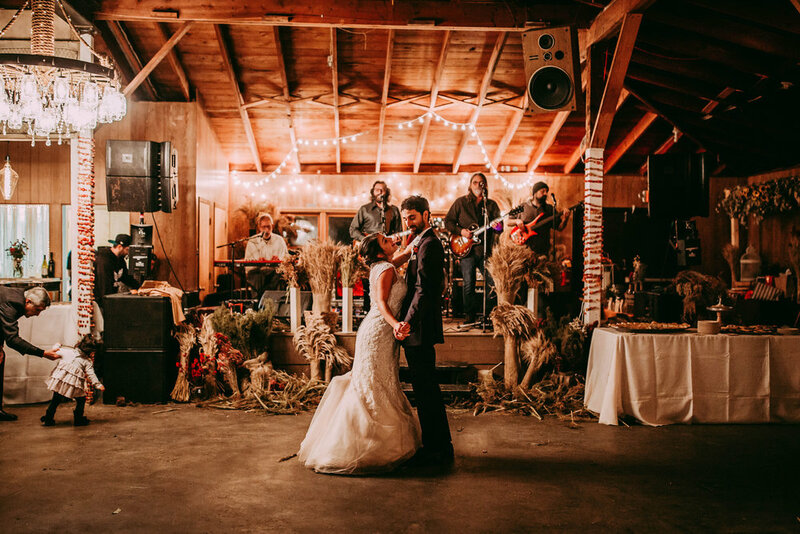 I had this crazy vision to walk down the aisle with everyone singing the song Magnificence, which has special significance between Ben and I, as well as a purifying intent. People began singing as I walked down the aisle and continued while we did the traditional seven circles. I have few videos of it thanks to Aunt Jan and Cousin Mark so ask me if you are curious. Thanks to our huppah carriers and loved ones who supported us. Pictured left to right, Nephew Jack, Sister Syd, Cousin Sky, Rabbi’s in back, Brother Jude, Besty John, and Brother Ari. Photo Credit Ariel Panowitz. We danced to How Sweet it is to be Loved by You. Peach Truck played two great sets! Thanks for letting me mull in the glory and happiness of that special day with you. Special thanks to my cousins Ariel and Mark for capturing all our special moments. Now on to the Maine honeymoon, here are four snaps of our lovely time mulling in the joy and splendor of our union. When we got back we didn’t miss a beat. I began changing my name, now that is a whole post in itself. We noticed that the cabbage in the basement fridge was ready for kraut, and we finished harvesting all the goodies to prepare for winter. Add it to a 5-Gallon bucket with salt and caraway. Put the cabbage in a bucket and let it mull. It has been a month since we made this and now we are enjoying the kraut. We are also beginning to mull over future ideas and business plans. I have decided to try a very low key, no commitment four seasons flower business. The first season begins now. I will be selling dried flowers wholesale and may try to do a pop-up dried flower bouquet for Valentines Day. Below are some pictures of our flower stock. Just want to take a moment to wish you many enjoyable moments of mulling over your dreams, your current reality, and all the goodness that winter wonderland has to offer. Put some mulling spices in some cheap wine or apple cider, let it sit on the low heat of your stove top and let’s cheers to a joyous holiday season. Up until now, we have not shown too much of our produce production. Here is a small bit of what we have in store, lets just say we have a few tons of squash and pumpkins on our hands, maybe a 400 pounds of watermelon, and 50+ pounds of greens… not to mention a ton of other goodies. No one is going hungry around here. A time of great abundance! Drying and processing the abundance! A morning in the squash breeding patch! Our second podcast episode, it's not directly about the wedding prep, but this project is important. It represents how sweetly our interests line up. Betsy tries out her chops as an interviewer. We love tulsi and tulsi loves us. It decided to grow in the cracks at the base of the steps leading to our house, and we feel this is a good blessing. Today is July 4th, we are about 13 weeks away from wedding day. I am resting assured that we will have plenty of flowers. Wow! We have been blessed with nice rains every week, no intense storms, and a hot year. It is all I can do to keep up with flower harvest and processing. The time will soon come where I can't keep up with it all. There only only seven of these Persian Jewels Love in a Mist. I spent 3 hours weeding those few plants out because I love them so. Another plant being babied are these Bells of Ireland. About 10 of these plants, said to bring good luck. Check back to see how cool they look when being processed. Lots of fun! I only started a handful of Gomphrena (below) but they are big producers. Today there were about 20 flowers on each plant. Given that I am harvesting twice a week, that means I will have no less than 240 stems for the wedding. Celosia can have issues with disease, so I have had to pull a few plants, but luckily I have around 200 plants so its no big deal. Similar to the Ageratum, once harvested these are pressed and turn out marvelous, keeping their color. Above is a poor pic of a great flower, Drumstick, been harvesting by the handful check back to see their true nature. This above is Sweet Annie, perhaps my favorite filler, it smells amazing! Plus, it combats the weeds well so it is low maintenance. Fleabane, been pressing these. They turn out well also been hanging them to dry and they leave a mess. I love St. Johns Wart, it gets me through the dark days of winter. Hopefully I have time to process it. I have tried to press it and it turned out well. Ageratum abounds! Harvested by the ton, pressed n' dried. Not to be confused with Starflower below. That was the first bud forming, I have now harvested 3 flowers. With only 15 plants these are some of the prescious plants which I have been babying. Above and below is Cornflower, also called Bachelors Button. Similar story as Persian Jewels Love in a Mist, these little ones needed to be direct sown as seed. They had a fit with the weeds and took a long time to come up, so I planted a second round at our home garden. Now they are coming on strong! This glowing beauty pictured below is a Statice. They are a graceful flower that is easy to dry and will be a wonderful complement! We got decorative Sunflowers - Sunbright is the variety pictured below, bred for their ability to dry well... time will reveal whether we agree. These that follow came to us from previous gardens and luckily I have a keen eye for these ones as babies and when others were claiming I was being ignorant of the weeds, I knew that they would bring beauty to the plot, be a fun summer bouquet for friends, and bring cheer to my home and work environments. We give thanks to previous plot holders for establishing this Peppermint thinking hit tea for the wedding. Me in action cutting Strawflower with a bucket full of goodies. Thanks Nomi for the pics of me that open and close this post! This is the very first foray to podcasting - will the wold be able to hear Besty and I take a walk and talk through our backyard garden? This is the story of why there are ten teams of UNL staff, faculty and students competing to grow the largest watermelon. “What! That will take up a 20 foot square, thats about a third of our whole garden!” I whine. “Well, it’s that or figure out another place to grow it” Betsy is quick to deliver ultimatums of this sort, this one only clocked about a 4 on the richter scale. So I could have persisted and avoided any involvement with giant watermelon vines - but the truth is, I’m a sucker for watermelons. The head of operations of the Agronomy farm did not hesitate to offer 8000 square feet on east campus when I proposed a contest. When word went out, about ten teams stepped forward with interest. Each agreed to chip in $20 so that we could have our own budget for shared infrastructure, like seed starting supplies, fencing, irrigation, and cages to protect the fruits. And all agreed to keep the area free of any other watermelon cultuvars to keep the seed true to type for donation to the library in Fall ’18. Contestants either tried their hand at starting their own seed, or left that part to me and a new friend, Nick Arneson, who I got to know during this process. Two or three contestants are growing off campus, but most are side by side at our plot about 250 yards east of the Law College. To harden off the starts, I shuttled them back and forth between home and school so they could live outside, but also be available when contestants were ready to adopt them. It’s fun to see the different approaches to growing these, exeryone has their own twist, but most teams are pretty hands-off. This is no big surprise as the summer time is the busy season for graduate students in agriculture, and most contestants fit this description. I'll brag that my plants were first to set fruit, and first to fall victim to rodent damage and poor pollination! I hope others will stay vigilant and avoid these sorrows. The winner will recieve bragging rights and a laser-cut wooden pin that will be proof of victory in the first UNL giant melon grow-off. My hope is that this will leave a legacy of continued opportunity for students on East Campus to access space to grow gardens in more informal settings. I would be especially pleased if this project contributes to a future on East campus where students from other disciplines can easily access garden space and cross paths with new faces they wouldn’t otherwise see. But, the matter at hand is unquestionably to produce melons of uncanny size and celebrate our efforts together this Fall. As Pat says, "A trip to the 'B Hive' is not complete without a tour of the basement." Smiles, it's oddly true, we love showing people our basement projects when they visit us. 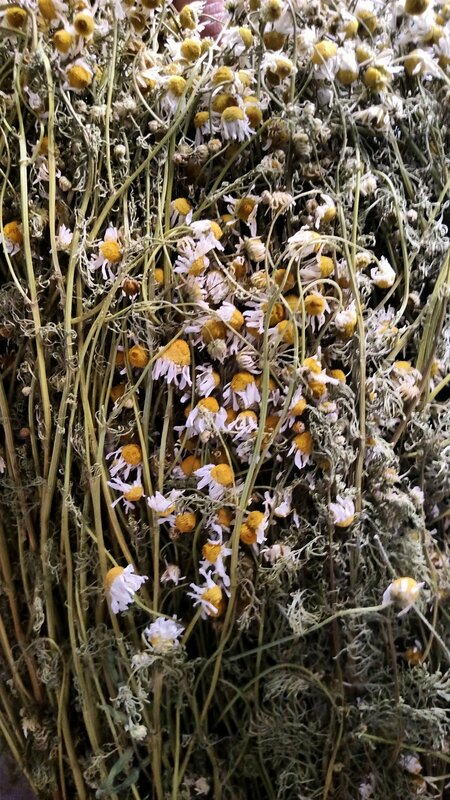 Anyhow, here is a tour of the basement at the moment, about 7 bags of perfectly dried chamomile. And 4 window screens packed with dried chamomile. What is going to happen next? You can see by looking at my bio that I am a big fan of making herbal teas from personally wildcrafted herbs. Not that we have the time to cut, sift, and package chamomile tea for the wedding, but maybe I can have a few girlfriends over and make it happen. That's the goal. Time will tell. We had a pleasant surprise to see a lot of baby chamomile plants coming up in the Prairie Pines plot thanks to last year's beginning farmer. My best guess based on the form is that it's the German variety, Matricaria chamomilla, the self sowing annual. We left them be. They went to flower about 3 weeks ago, so early May. I harvested a lot one evening. Ben took them to the drier on UNL Campus. The field was just beckoning for a second harvest so I brought home another bigger bunch. This one went into the basement and received the traditional treatment, laid out evenly across old window screens with two fans. At that time, Ben said enough, so even though there is still about two more equal sized harvests left, the plot neighbors will glean them in trade for watching our chickens while we go to Austin for our engagement party. Whatever's left will go to seed, we will harvest some and let the rest self sow and be a fun surprise for the next gardener in that space. Like many gardeners, looking at seed catalogs brings a great joy and excitement during the off season. It is a time for pondering what next years garden might look like. This year, it was even more enthralling knowing that I was going to grow flowers for our wedding. Knowing that it could freeze by mid-October, I chose to go with only flowers that can be dried. In addition to purchasing seed, I of course integrated a lot of saved seed because that is my passion. First seed sown were onions on February 1st. First flower seeds sown were Gomphrena. That same day I stuck the snapdragon seeds in the fridge. Matt & Kelsey brought some flowers to a soils gathering last year, and I was able to glean some snapdragon seeds from there gift! We started sweet potatoes late February. Starflower, not to be confused with Strawflower, went in on March 29 along with 'Flat Leaf' Parsley and Sweet Annie. April was pretty much filled with transplanting the aforementioned baby plants into bigger spaces. I planted a few more trays of extra ageratum, strawflower, starflower, and others. Also seeded bulbing fennel, a personal favorite. Ben sowed some Shishito Peppers (his personal favorite) and eggplant. April was super cold and even into May we had freezing temperatures. Regardless, the plants had to move outside because our basement set up was full. Ben built a great little greenhouse setup to accommodate this shift. May 1st I seeded some tomatoes. 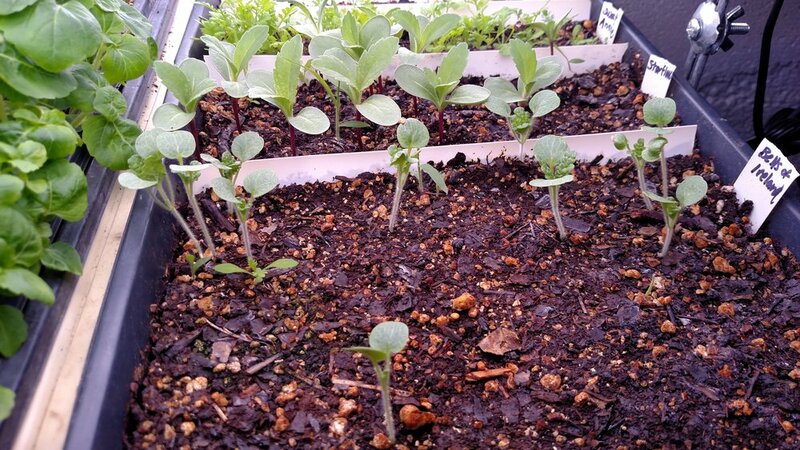 The soil didn't really warm up until the third week in May, so that is when 'Sunbright' Sunflower was sown. Pictures of direct sown babies soon to come! Once I got the seeds in the mail I used my catalogs and go-to book, The New Seed Starters Handbook, to write little notes to myself all over the seed packets. Flower seeds are so fussy and unique, so I wanted to do right by them and see them into life. March madness set in quick! 'Apricot/Peach Mix' Strawflowers will be the main floral decor for the wedding, I have sown them four different times over the season, with the first sowing on March 1. Also on March first was 'Forest Fire' Celosia (there's a story behind why I picked the one called, forest fire), Snapdragons, Cutting Celery, and Clary Sage Salvia. March 8th 'White Swan Lake' Statice & 'Blazing Stars' Liatris were sown. That week I stuck the Bells of Ireland in the fridge. 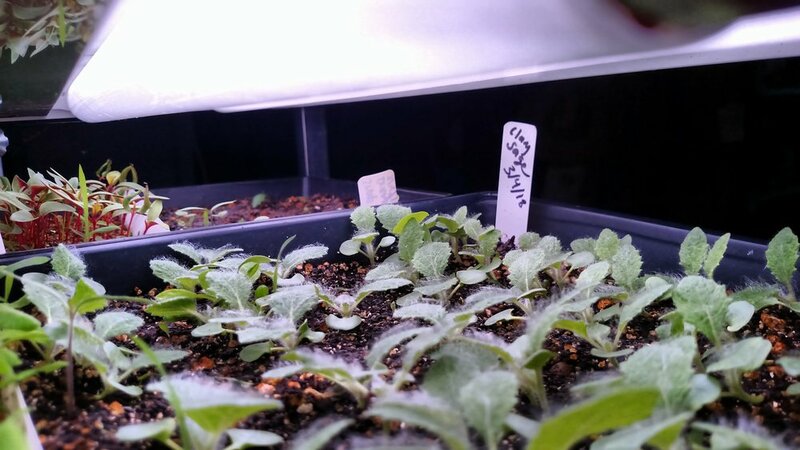 'Red Flint' Ageratum, Drumstick flower, Basil (Sweet, Genovese, and Tulsi) , 'Melissa Savoy' & 'Pennant' Cabbage, 'Lacinato' Kale, 'Bright Lights' Chard, Collards, and more Strawflower went in on March 15. When it was finally time to direct sow (around May 15). I cleared an area at Prairie Pines. There I sowed, Urecht Blue Spring Wheat, Persian Jewels 'Love in a Mist', Dara Carrot (specifically bred for the flowers), 'Irish Poet' Tassel flower, 'Single Alba' Baby's Breath, 'Classic Magic' Cornflower. This is just the beginning check back soon to watch as these flowers grow and blossom! You want to grow What!? Betsy said she wanted to grow an elaborate spread of salad vegetables for the wedding celebration. Also, all the flowers and decorative grain, which we will dry throughout the season. Ben said I consent to this lunacy under this condition: if either of us is losing our minds with all the work, we will just buy the stuff and save our sanity.